Why do I call myself a Conceptual Narrative Photo Artist? I do this because my imagery work is not about realism but the story of reality and life retold in a fictional pictorial narrative . 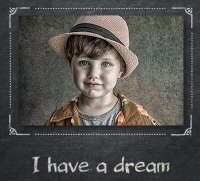 As a photo artist I go beyond the initial photo capture, I will add in scanned elements, textures, words along with many over layed photographs which eventually will all combine and become one piece of unique artwork with has its own unique narrative. My aim is to engage my viewer into a visual and thought provoking discussion on social matters, thoughts on general life matters and other fantasy ideas . I like to think of myself as a visual storyteller and that my fictional narrative is striking up a conversation which can both challenge and or inspire you.